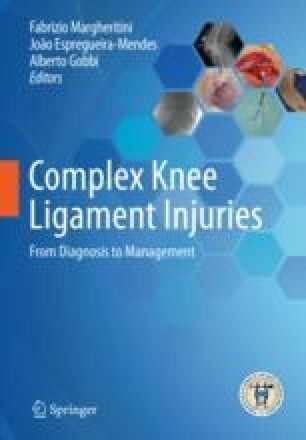 Knee dislocations (KDs) are potentially limb-threatening injuries, and therefore a clinician should be always aware of it, especially in high-energy trauma or in obese patients with low-velocity injuries. As KDs are usually associated with other injuries, the clinician must initially follow the ATLS principles. Careful history and physical examination are mandatory in order to achieve the best results. In particular, the most important factors that need to be evaluated are the mechanism of injury, the ability of weight bearing after the injury, and whether a “pop” was felt or heard by the injured patient. Regarding the physical examination, inspection for any skin lesion, palpation of the knee, evaluation of both passive and active range of motion, and comparison with the contralateral one are of crucial importance. Moreover, vascular examination is always necessary as the incidence of popliteal artery injury is 3.3–24%. Therefore, in such cases a clinician has to palpate dorsalis pedis and posterior tibial pulses bilaterally and calculate the ankle-brachial index (ABI) in order to proceed for further investigation or not. Eventually, as the incidence of nerve injury ranges from 4.5% to 40.0%, detailed neurologic examination should be conducted. Frontal and lateral plain films of the knee must be ordered before and after reduction as a standard procedure. CT scan after reduction is useful in case of fractures. MRI is also useful after initial management to reveal the whole spectrum of injuries. The reduction of the knee should be attempted with the patient under sedation, either in the emergency department or at the operating room with gentle in-line traction. After reduction is done, the knee should be splinted in 20° of flexion, opening a window to allow vascular evaluation of the foot. If closed reduction is unsuccessful, the surgeon should proceed to an open reduction of the knee. High suspicion of compartment syndrome is vital in such cases. Absolute surgical indications in patients with a KD include (a) vascular injury, (b) irreducible dislocations, (c) gross instability on examination with failure to maintain joint reduction, (d) open injuries, and (e) inability to tolerate mobilization in a brace, due to pain or noncompliance.